Michael Tolkien’s sixth full-length collection is a reflection on how the present engages with the past, and how their connections continue to resonate within the poet’s memory and imagination. The tone, appropriately, is quiet. This is no place for the clatter of experimentation but for the slow accumulation of detail, a comfortable and readily accessible syntax, and the familiar language of everyday. It makes for a coherent collection in which the lack of surprise is compensated for by the recurring motifs. 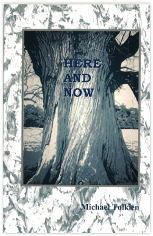 The apparently -simple Here and Now of the title appears in several poems, reminding the reader of the poet’s underlying concerns along with his deep enjoyment of location and its hold on memory. to see it a month ago. But Tolkien’s Rutland home by the willow-lined olive Welland offers him a range of material: the birds, landscapes, trees, neighbours, weather, the background whispering from his favourite lyric poets, as well how to balance the past against the present. In ‘Light and Shade: A dialogue’ he lets Light ask Where is your here and now? while Shade clings to … where opposed/ poles and undercurrents plague/ every detail like flitting shadows. – although whether this is spiritual or closer to the nudge a new poem can give, I’m not sure. Poems gathered together in the third section, ‘Vantage Point’, have a lighter tone; they are observations about others (often on holidays abroad) or celebrations of family occasions. Here his eye for detail works well: we have a French couple making elegant work/ of tiny coffees … (‘Off-Duty Tableau’); Centuries of gilt-framed squires line/ the old stables, now a café and museum (‘Ancestral Hall’); He looks young for a father, shy of what/ a camera reveals, putting on a photo smile/ of grim pleasure…(‘Random Flashback’). and each other forty years before. Isn’t this all the ‘now’ we need? The connection between these poems gives a quiet satisfaction, and the carefully-modulated voice supports the balance between question and resolution. Perhaps we should all ask ourselves how much ‘now’ we need. Should you wish to buy this collection you will have to contact the poet at his web address given at the head of this review or else write to Severn Press which has no online presence at the time of writing.